". . . The victory that overcometh the world, even our faith." I John 5:4 Overcoming faith! That is the need of the hour. Not only faith to start on, but faith to stand on. Faith that is good enough to live by is good enough to die by. "Lord increase our faith." "And the hand of the Lord was with them, and a great number believed, and turned unto the Lord." Acts 11:21 In order to have His hand with you, it is absolutely necessary to leave all in His hand. When God is with us, people will believe, and when they believe, they will turn to the Lord. "Let the beauty of Jesus be seen in me." "Yea, though I walk through the valley of the shadow of death, I will fear no evil, for thou art with me; thy rod and thy staff they comfort me." Psalm 23:4 The man who places his faith in God will not be afraid of the future. "Have faith in God." " If thou canst believe, all things are possible to him that believeth." St. Mark 9:23 Daring Christians are a delight to the Lord. "Not my will, but thine be done." St. Luke 22:42 God knows best and He will do what is best. He is our advocate; trust His judgment. "Without faith, it is impossible to please God." "...A man full of leprosy, who seeing Jesus fell on his face, and besought him, saying, Lord, if thou wilt, thou canst make me clean. And he put forth his hand, and touched him, saying, I will, be thou clean. And immediately the leprosy departed from him." St. Luke 5:12, 13 With the acknowledgement that something was wrong came the assurance that there was One who could make it right. "I will, be thou clean." "And looking round about upon them all, he said unto the man, Stretch forth thy hand. And he did so, and his hand was restored whole as the other." St. Luke 6:10 Blessed is the man who obeys the voice of Jesus and believes Him for the inexplainable and the impossible. Believe only. "He is able." "But without faith, it is impossible to please him, for he that cometh to God must believe that he is, and that he is a rewarder of them that diligently seek him." Hebrews 11:6 Faith takes the strain out of life and the suspense out of eternity. God give us faith to remove mountains and grace to look over the little hills. "And Simon answering said unto him, Master, we have toiled all night, and have taken nothing; nevertheless at thy word I will let down the net. And when they had this done, they inclosed a great multitude of fishes, and their net broke." St. Luke 5:5,6 Jesus didn't go to where the fish were necessarily, but to where the faith was. He will honor our faith and obedience. "When Jesus saw their faith, he said unto the sick of the palsy, Son, thy sins be forgiven thee." St. Mark 2:5 Apparently, God honors the faith of the believer in the behalf of those who have none. A religion of ritual and works can wear you out. A faith that believes God for anything can lift you up. "Without faith, it is impossible to please him." "...Lord, if it be thou, bid me come unto thee on the water...he walked on the water, to go to Jesus." St. Matthew 14:28,29 When we step out on faith, the Lord will give us something to stand on. "Faith is the victory that overcomes the world." "Only believe." "But my God shall supply all your need according to his riches in glory by Christ Jesus." Philippians 4:19 He supplies what we believe Him for, not what we wish for. Have faith in God. He is able. "And I say unto you, ask, and it shall be given you; seek, and ye shall find; knock, and it shall be opened unto you." St. Luke 11:9 Here is a formula that puts our faith to work in getting what we need and what He wants us to have. Pray on! Believe only! "And all things, whatsoever ye shall ask in prayer, believing, ye shall receive." St. Matthew 21:22 God for a miracle. "All things are possible to him that believeth." Lord, we believe! "So the father knew that it was at the same hour, in the which Jesus said unto him, Thy son liveth: and himself believed, and his whole house." St. John 4:53 The Lord needs to only say the word and wonders appear. He has spoken. Let us believe what He said and is saying to us now. "Believe only." "If ye abide in me, and my words abide in you, ye shall ask what ye will, and it shall be done unto you." St. John 15:7 This does not call for a constant "tug of war" striving and struggling, but a simple natural trust as we release our faith to the Father in the name of Jesus. In so doing, we appropriate what He has already provided. Praise His name for it! "Even so faith, if it hath not works, is dead, being alone." James 2:17 Faith becomes effective when it becomes active. Take it out of the talking and thinking stage and put it to work practically, quickly and prayerfully. "God hath dealt to every man the measure of faith..." It is enough...use it! "When the evening was come, they brought unto him many that were possessed with devils, and he cast out the spirits with his word, and healed all that were sick. That it might be fulfilled which was spoken by Esaias the prophet, saying, Himself took our infirmities, and bare our sicknesses." St. Matthew 8:16, 17 The ministry of Jesus was one of action and authority. He has passed on to all believers the same boldness if we will but see it and use it. He said, "The works that I do shall he do also... and greater..."
"For verily I say unto you, That whosoever shall say unto this mountain, Be thou removed, and be thou cast into the sea and shall not doubt in his heart, but shall believe that those things which he saith shall come to pass, he shall have whatsoever he saith." St. Mark 11:23 Do what Jesus said. Speak to your mountains. They have done the talking long enough. "For with God, nothing shall be impossible." "And this is the confidence that we have in him, that, if we ask anything according to his will, he heareth us. And if we know that he hear us, whatsoever we ask, we know that we have the petitions that we desired of him." I John 5:14, 15 Many find things in His Word and start wondering if it's for them. Don't be looking for conditions but compassion. Take Him at His Word. He has "magnified His Word above His name." "Verily, verily, I say unto you, He that believeth on me, the works that I do shall he do also, and greater works than these shall he do, because I go unto my Father. And whatsoever ye shall ask in my name, that will I do, that the Father may be glorified in the Son. If ye shall ask anything in my name, I will do it." St. John 14:12,14 Release your faith with me as we look to the Father. Jesus, I take You at Your Word and believe now that multitudes will be saved, believers filled with the Holy Spirit, others healed, and needs met in every part of their lives in Your Name and for the glory of God, Amen. "And Caleb stilled the people before Moses, and said, Let us go up at once, and possess it, for we are well able to overcome it." Numbers 13:30 Don't you like to hear someone who follows a negative report with some straight forward talk expressing a God-given faith? You be that person. Believe God for anything. Speak your faith and He will surely come through. "And the Lord said, If ye had faith as a grain of mustard seed, ye might say unto this sycamore tree, Be thou plucked up by the root, and be thou planted in the sea, and it should obey you." St. Luke 17:6 Spoken faith is a mighty force capable of bringing to pass what appears to be the impossible. Dare to believe God for anything. Father, we believe You for great miracles in Jesus' name. Amen. "By faith the walls of Jericho fell down, after they were compassed about seven days." Hebrews 11:30 There is no wall thick enough or armed enough to stand against one seed of faith. On with the march. Faith, praise, power and obedience will see the walls come down and the windows of Heaven open. Praise God! "And they said among themselves, Who shall roll us away the stone from the door of the sepulchre? And when they looked, they saw that the stone was rolled away, for it was very great." St. Mark 16:3,4 Like us, we anticipate blockades that have long since been removed. Get rid of that negative thinking and nothing shall be impossible unto you. "Believe only." "And Jesus said unto them, Because of your unbelief, for verily I say unto you, If ye have faith as a grain of mustard seed, ye shall say unto this mountain, Remove hence to yonder place, and it shall remove, and nothing shall be impossible unto you." Take another look at this and never again make little of your faith, no matter how small it may look to you. It is mountain moving. Use it and a miracle is in the making. "And he said unto them, Why are ye so fearful? 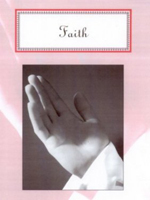 How is it that ye have no faith?" St. Mark 4:40 God must stand amazed at our lack of belief in a world of miracles. "If ye shall ask anything in my name, I will do it." St. John 14:4 Answered prayer yields to the bold approach and daring faith. "All things are possible to him that believeth." "He is able." "For with God, nothing shall be impossible." St. Luke 1:37 What the world needs is more mustard seed faith to remove man-made mountains. "According to your faith, so be it unto you." "The Lord shall preserve thy going out and thy coming in from this time forth, and even for evermore." Psalm 121:8 Our gracious Father gives direction and protection to those who follow in faith. "I am with you." "And he took him by the right hand, and lifted him up, and immediately his feet and ankle bones received strength. And he, leaping up, stood and walked and entered with them into the temple, walking, and leaping, and praising God." Acts 3:7, 8 If our faith is up-to-date, you can be sure that the days of miracles are not past. "I am the Lord thy God, I change not." "Cast not away therefore your confidence, which hath great recompence of reward." Hebrews 10:35 If you have earnestly prayed about it and have the conviction that what you are doing is right, the Lord will furnish the courage to see you through. "Only believe." "... Our God is able..." Daniel 3:17 There is no limit to what the Lord will do in answer to daring faith. "With God, nothing shall be impossible." "But without faith, it is impossible to please him, for he that cometh to God must believe that he is, and that he is a rewarder of them that diligently seek him." Hebrews 11:6 The man who truly walks by faith will not run the risk of being embarrassed. "Have faith in God." "Yea, though I walk through the valley of the shadow of death, I will fear no evil, for thou art with me; thy rod and thy staff they comfort me." Psalm 23:4 The man who has put his faith in God will not be afraid of the future. "Have faith in God." "And he said to the woman, Thy faith hath saved thee; go in peace." St. Luke 7:50 Put up whatever faith you have and He will match it. Then look for miracles. "God hath given to every man the measure of faith." Use it! "Say to them that are of a fearful heart, Be strong, fear not, behold, your God will come with vengeance, even God with a recompence; he will come and save you." Isaiah 35:4 When fear comes calling, turn up the volume of your faith. "Fear thou not for I am with thee... I will uphold thee with the right hand of my righteousness." "For I say, through the grace give unto me, to every man that is among you, not to think of himself more highly than he ought to think; but to think soberly, according as God hath dealt to every man the measure of faith." Romans 12:3 Don't pray for more faith. Use what you have and watch it multiply. "According to your faith, so be it unto you." "For God hath not given us the spirit of fear; but of power, and of love, and of a sound mind." II Timothy 1:7 Turn your fears back with your faith. "God hath not given us the spirit of fear," but He has given us a measure of faith. It is enough. It is mountain moving. "Thy faith hath made thee whole." "Praise God from whom all blessings flow." "By faith Abraham, when he was called to go out into a place which he should after receive for an inheritance, obeyed, and he went out, not knowing wither he went." Hebrews 11:8 If we take the first step of faith, it won't be too long until we see that we are not alone. "I will never leave thee nor forsake thee." The big word is obey. The big fact is that He loves us and has plans for our lives.